Perth City YHA, Perth, WA. The Perth City YHA is located in the city center of Perth. The organization is operating for more than 100 years and has opened hostels all over the world. The hostel provides opportunity to all especially for young people, for education, personal development, fostering friendship and bringing about a better understanding of others and the world around them. With increasing use of electrical appliances by guests, the YHA wanted to reduce its power bills. It is opened 7 days a week and thus ideally suited for rooftop solar photovoltaic power generation. The major load in the premises during summer is air-conditioning which coincides with the sunshine hours. After consultation with the management and assessing the roof space available, it was decided to install a 37kW Solar PV system which has the potential of generating about 190kWh (or units) per day. It was estimated that the solar power generation would offset approximately 30% of Perth City YHA´s annual electricity consumption with a simple payback period of 2.2 years. The engineers at Regen Power collected average radiation, air temperature and other climate data throughout the year prevalent in that particular area to determine the appropriate system design for the required 37kW solar power. The system consists of 148 numbers of Hanwha Solar One 250 W Polycrystalline solar modules. The panels are supported by a 25 years warranty and are certified by TUV, CE, UL and CEC worldwide certifications; along with meeting all Australian and European quality and safety standards. Two numbers of SMA Tripower inverters (2x STP 15000 TL has been installed) which offers exceptionally high yields with an efficiency of 98.2% and supported by 5 years warranty. Like all Regen commercial installations, the system also includes a remote monitoring system. Regen also installed our own state of the art Solarlog – Monitoring system in this project. The monitoring system can process and analyze plant data with the help of the Solar-LogTM data logger. This can be done either in graphic or numerical format in the form of daily, monthly and annual data reports. In addition to the yield and input voltage, individual strings and inverters or environmental data associated with plant monitoring can be presented with the help of the sensor box as well as other reference values. 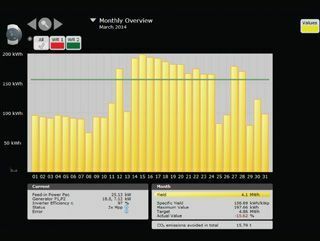 Our monitoring system supports the “Full Service” maintenance concept through online access to the plant. 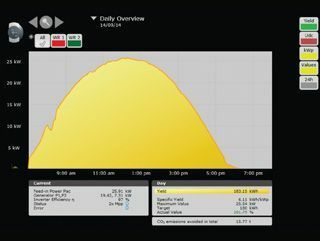 The monitoring system not only measures and compares the yield data of the individual strings, but also performance data of the individual inverters. Regen can enter into maintenance contract with the plant owner – we offer the customer complete package with monitoring, maintenance and servicing of the solar power plant. The solar power installation is expected to meet about 30% of the annual electricity consumption of the hostel. This is equal to about a carbon footprint saving about 39 tonnes of CO2 per annum – equivalent to eliminating the carbon footprint of 7x average Western Australian household´s annual electricity consumption. Based on an average of 142 units per day for the 37kW system, and factoring in various other parameters, the system has a rapid return of 2.2 years.